2nd International Early Childhood Congress Hosted by OECD: "The Transition To School: Equity, Quality & Innovation"
Thank you Nathalie, honoured guests. I am pleased to share with you the thinking, which guides the work of the Margaret and Wallace McCain Family Foundation. It is premised on quality early education as an effective promoter of equity, and equity as essential to democratic societies. Educators are able to assess the equity gap in their classrooms on the first day of school. Some children arrived filled with excitement and anticipation; others with fears and tears. For many youngsters those initial anxieties persist until they leave school, often without the skills needed to navigate in an increasingly complex world. Good practice can ease children’s transition to school and prepare them for success. When early educators and primary teachers have a common knowledge foundation and a shared pedagogy of play-based learning, children benefit. But these strategies apply to children entering primary education with preschool experience. 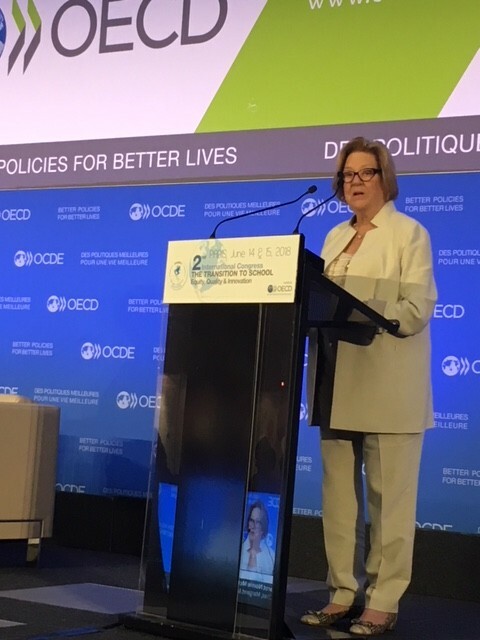 Our discussions must keep front of mind the one-in-three children below the age of four in OECD countries who do not participate in any early years programming. Neglecting children who never attend preschool while improving the experiences of the children who do, grows inequality. When children in some families benefit from preschool that others can’t afford, people begin to see the system as rigged against them and their children. The frustration feeds into populous rhetoric with self-harming consequences from Trumpism, to Brexit, to the contentious electoral race in my own province. Even within early education services inequity can be perpetuated. It happens when low-income families are subjected to demeaning processes for their children to participate. It happens with the promotion of “school readiness” suggesting that some children must be made ready to learn. It happens through assessments of very young children used to document the gaps between cultural, racial, and linguistic communities and then blaming groups for their lack of educational progress. It takes places when newcomer children are segregated into special classes; effectively privileging the children of affluent families with exclusive education. Then there are the assumptions that educational gaps can be addressed with boutique programs. These can be lucrative for their promoters, with few validated outcomes for children or families. The greatest challenge to creating a continuum between early childhood and primary education are public policies, which assign the education and care of very young children to a child care market while leaving public education to compensate the victims of market failures. This is why our Foundation encourages the extension of public education to include younger children. The goal is to create an integrated birth to graduation system covered by the principle of universal access. An educational continuum designed to reduce inequality must be located within a family strategy. Good educational care for children alleviates the “care penalty” imposed on mothers, which negatively impacts gender equity. By organizing education to support parents’ work, we can reduce inequity that is rooted in family poverty. Quality early education for all takes advantage of the developmental window that is foundational to children’s cognitive, social, emotional and physical well-being. These are not discrete domains. Language is a cognitive skill essential to communication. Being understood and understanding others is associated with emotional and social well-being, which manifests in better health and economic outcomes. These in turn impact civil society and its institutions, which are the foundations of democracy. The quality of schools is also a determinant of healthy, democratic societies. While filling the gaps in early education, we must protect public education. Under-educated populations and democracy cannot co-exist. This is why the architects of populism have made the destruction of public education central to their agenda. Charter schools have not provided families with educational choice nor reduced the achievement gap for disadvantaged children. They have made private operators fabulously wealthy with public money. Children attend for long enough -- duration matters. Yet in most OECD countries, including Canada, upside down thinking results in social investments growing as people age. Intergenerational inequities emerge when spending on a retiree is almost double that spent on a young child. The coming generation faces challenges mine never considered. When I was born there were 2.4 billion people on this planet. By 2025 there will be 8 billion. These numbers test the limits of the environment and our ability to survive as a species. Humanity’s tomorrows depends on our youngest citizens today. Now as never before, the evidence must be harnessed to serve not just every individual in our society, but every society around the globe.